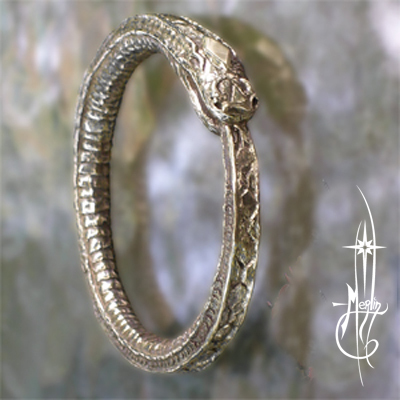 My latest version of the Worm Ouroboros as an amulet, this custom, one-of-a-kind bronze pendant is two and one quarter inches across and fully detailed with scales, a “diamond” on the third eye and (classically) swallowing it’s tail. As requested by my client, this is a unique piece with no mold taken. Heavy because of it’s size, it is designed to be hung on a sturdy chain through the middle. I have already made several versions of this piece, one as a custom cloak clasp, and two versions as a ring: one smooth, one with scales. Both of which could be alternately worn as a pendant. This version was designed to be large and developed as a heavy, detailed piece: each scale is textured. If you are interested in having a similar piece made, please visit my How to order Custom page.